A couple of Summers ago, while Katelyn was over at a friends having a sleepover, her friend's mother made home made pizzas. This is something, I don't know why I haven't made before, maybe because and I know this may seem weird, but my husband and I aren't huge pizza fans, unless it's from a wood burning oven at an authentic Italian restaurant. Since my daughter thoroughly enjoyed herself, that night left a memorable impression on her, and I love to see my children happy, that I've been wanting to make home made pizzas with them! 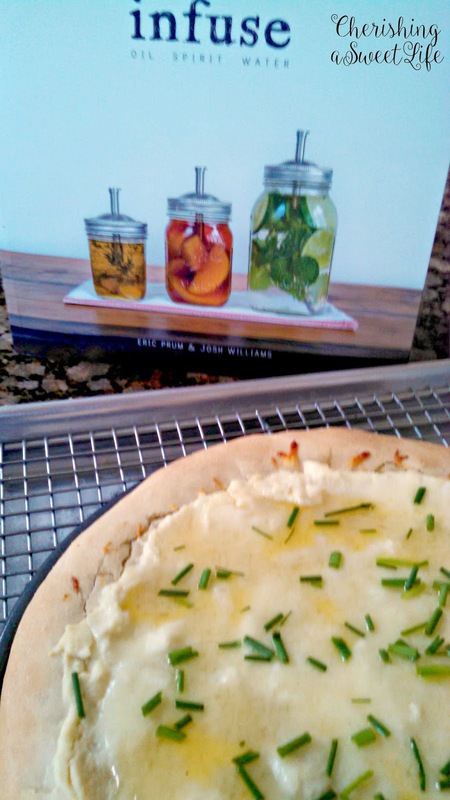 Then I saw this one photo from my cookbook review of (affiliate link) Infuse: Oil, Spirit, Water by Eric Prum and Josh Williams, caught my attention. It is a recipe for homemade Pizza Bianco, and my mouth instantly started to water. For one, I love creamy sauces, like alfredo sauce or any white sauce, hopefully with a ton of cheese, and what really interested me was the combination of the honey drizzled over it and an infused chili oil, and chives. This sounded seriously incredible I couldn't wait to make it. It turned out to be one of the funnest things for kids to help make in the kitchen. It was so much fun, we had a blast! The girls had fun shaping the dough, and putting on the sauce, cheese and pepperonis! While I made the Pizza Bianco for me and my husband. The recipe for the Pizza is grilled, but I didn't feel like standing out in the heat of mid-day, I simply baked mine. 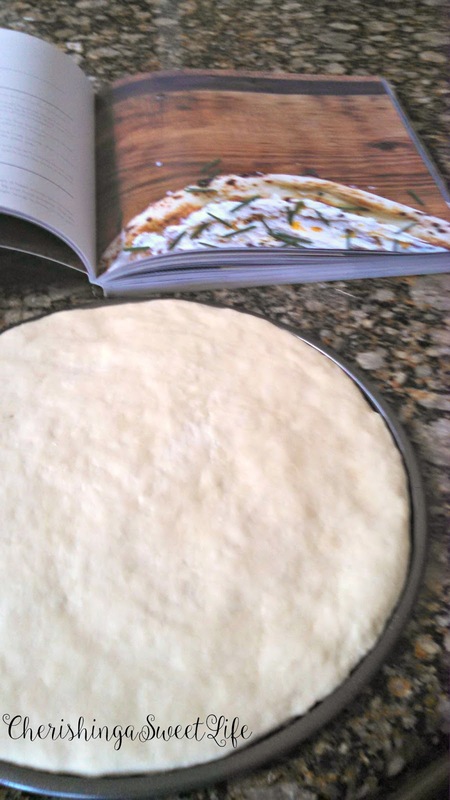 I was initially going to adapt a pizza dough recipe from Bobby Flay, but when I was going to buy yeast, I noticed Fleischmann's has yeast specifically for pizza dough. I simply followed the recipe on the back of the package. It was super easy to make, and it took a fraction of the time as using regular yeast, it was ready to use right away. No need for time to allow it to rise. 1. Preheat oven 425F. Stretch pizza dough out onto a pizza stone or I used the bottom of a 10 in springform pan. 2. Top with ricotta and cheese. Bake for 12-15 minutes for thin crust, or 20-22 minutes for thick crust. 3. 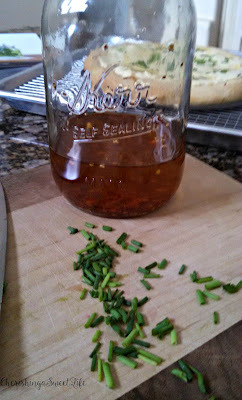 Drizzle honey, and chili oil. 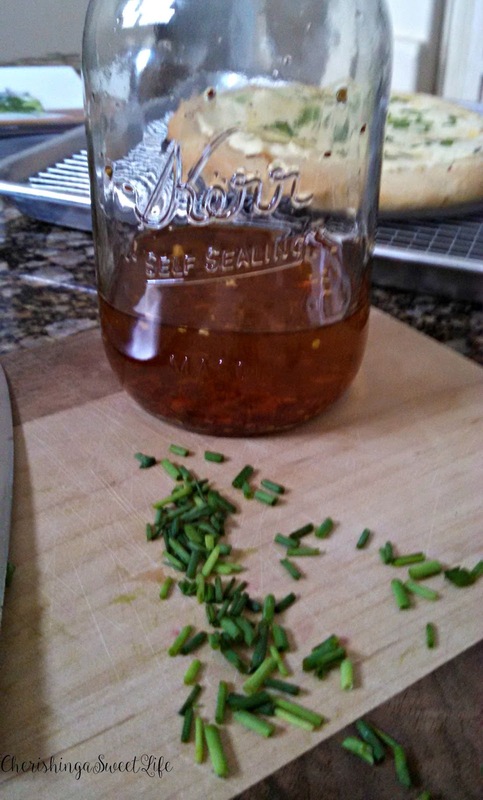 Garnish with chopped chives. *Chili Oil- Infuse 2 Tbls. crushed red pepper flakes with 8 oz. Extra Virgin Olive Oil in an 8oz mason jar. Shake to combine. For maximum flavor, let sit in cool, dark place for 2 weeks. It will keep stored for 2 months. I usually save a slice for you, but there wasn't any left to share. I am so very sorry! Sharing this at these parties! That looks absolutely delicious!! We are huge pizza eaters...we will try it from all restaurants and go back to the ones we really like. We also enjoy homemade pizza and make it every once in a while. We've been wanting to try it grilled, but will wait until the weather cools down just a little for a grilled pizza!! YUM!!!! Hugs!! Yum! We have been on a pizza kick here lately. We will have to try this one for sure! It sounds amazing. That sounds so good! We just made pizza last night, so I probably can't get away with trying this out today - but soon! My family loves making homemade Pizza as we can all pick the toppings we want to go on it. Plus we can even try new things Pizza Restaurants do not offer. Looks delicious! I have found pizza crust to be one of the easiest things to make...so I make one each Friday night. 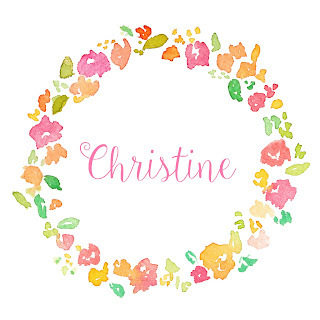 Christine, Thank you for posting your recipe with us at Brag About It! 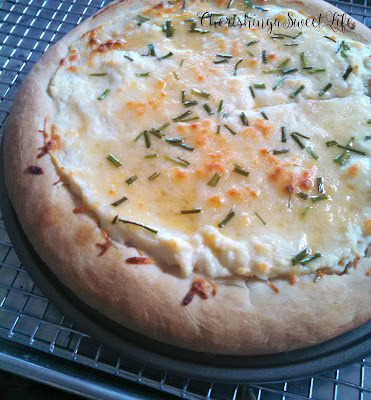 I'm pinning and looking forward to trying this - we love just about any kind of pizza around here! Hmm...chili oil. That is an interesting idea. I may have to try it. I also use the pizza dough recipe on the back of the yeast package. Has turned out perfectly every time. I use it for my stromboli & it is delicious! Oh Yummy!! Thanks for sharing on My 2 Favorite Things on Thursday!! I love having you! Hope to see you again on Thursday! Pinned! What a great pizza and a great recipe! Hope you are having a wonderful day and thanks so much for sharing your awesome post with Full Plate Thursday! This looks so easy Christine, I just tired some basil and it was great. 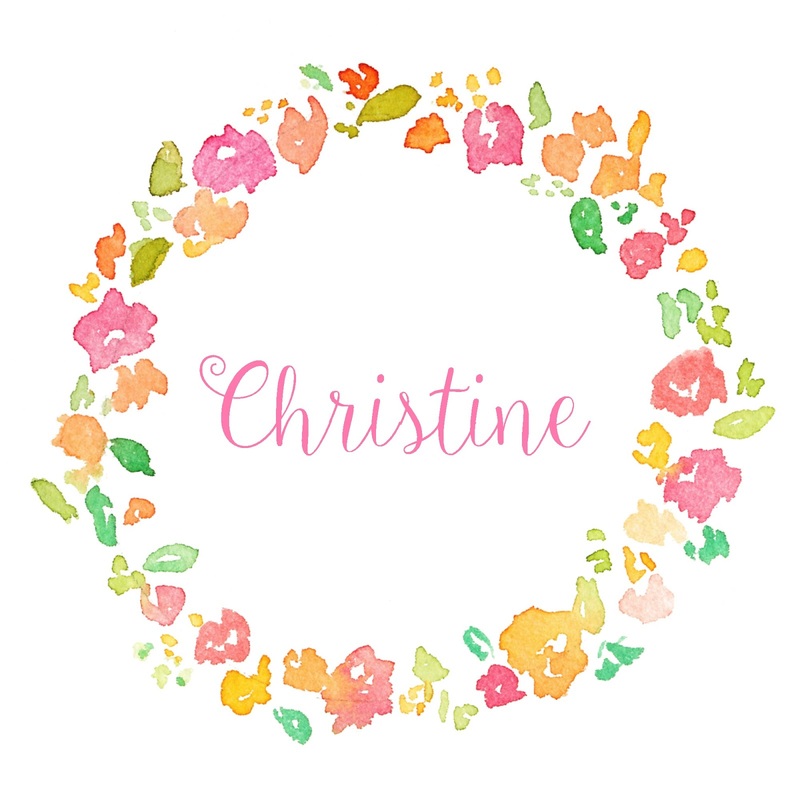 Thanks for Co-Hosting with #OMHGWW this month, so nice to have you share your blog each week!! Hope you enjoy your day!! I would love to have this kind of pizza over a pizza layered in lots of tomato sauce any day.i have enjoyed co-hosting #OMHGWW with you. This looks really delicious! Thanks for sharing this at the Say G'day party! Pinned and look forward to seeing you on Saturday!